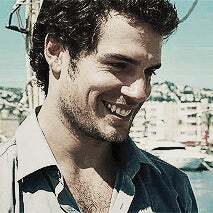 It's no secret that I adore me some Henry Cavill. I love him even more after this press tour, wherein it was revealed that he is indeed a big dork who can't wear a Tom Ford suit, though he repeatedly tries. I have (amazingly) had a life lately and couldn't get to see his movie until tonight. Worth the wait. I was getting frustrated with the spoilers that were becoming too frequent in the media. I love going into a movie and knowing very little about it. I decided that I wished I knew less about Superman, so I could enjoy this telling of the story more. I don't follow Superman, other than knowing the basic outlines of the legend: alien from Krypton (a dying planet) is sent by his father to earth, lands in Smallville, KS, adopted and raised by childless farmers, moves to Metropolis to be a reporter by day and Superman when people need him to be. I don't read the comics; I only got 4.5 seasons into Smallville. I saw Superman 1 (Christopher Reeve) about 5 years ago, then Superman 2 about halfway, two years ago. There's a Superman III, right? That just rolls of the tongue so well, there must be. Clearly, I am no expert. But I wished I knew less, so I could see this version afresh. The Bad: I got frustrated by the constantly interrupting flashbacks and pretty dang wooden dialogue. (When I can see the words on the page as an actor is saying them, it's pretty bad.) I feel that Zach Snyder is in love with special effects, and overuses them. I know how fabric moves, and I know there've been technological advances in rendering fabric, but that cape was RARELY fabric. It was yet another CGI effect. I understand there's more control in CGI, but I still was irked by it. This was supposed to be the "realistic Superman." Snyder likes to overuse his CGI, so it loses impact. I, too, was totaling up the cost of the damage in my head. Superman couldn't have taken the fight to, I don't know, a corn field outside of the city? Zod could bring it back to Metropolis. Superman didn't seem to care about the human city and the buildings that one would think he'd want to protect, seeing as how he's the Ultimate Good Guy. The Good: I really liked that they sort of deconstructed Clark Kent. Yes, they sent him on a Christ-like journey. I really wish they'd left a priest out of it. Cavill is 30, and I wish they'd stuck with that age, instead of Christ's sacrificial 33. But I do kind of like looking at the story of Superman as a Christ-like story. He's humanity's savior; it makes sense that he would have a hard time with that mantle. I wish it wasn't told so by-the-numbers. Subtlety is not Snyder's style. This is a retelling in the post-Iron Man world. That movie took the fantastical legend and put him into our world, with our conflicts. MoS could have gone further with it, but people were covered in dust while buildings collapsed around them and there was no mention/reaction of 9/11, when that's all my gut was seeing. That would probably have taken the story to a serious that it didn't necessarily want to go, which I understand, too. BUT! I also loved the development of the relationship with Lois. VERY different from what I remember, so it's still processing, but I liked her a lot. The way he related to her was tougher to read. It's hard to see something like that because so much of what you see can be the fate you know is coming. 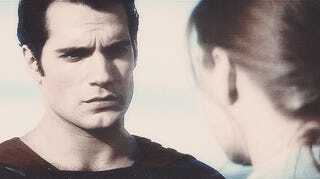 You know Lois is Clark's, and Clark is Lois'. It could have been typical rom-com meet-cute. It could have been all, knowing looks and stolen glances. It seemed instead to be mutual respect and curiosity. Can't wait to see where that goes. As for the suit, I loved that it was "the traditional dress of My People." Great touch. Rather than, "I had this fabulous idea to stand out from the crowd," or "look what I made from your baby blanket." And yes, of course, the Big Dork was quietly wonderful. I thought his angry teenager with the slightly higher voice was a fun touch, too. I hope the main cast is the same, but the director is different, next time around.